What is "Equine Therapy" anyway? But what is “Equine Therapy”? Equine therapy is an umbrella term that refers to a myriad of different kinds of services involving horses and healing – all of the services are therapeutic and impart benefits to their participants. However, only certain types of services qualify as actual therapy (and require a licensed professional) according to the Professional Association of Therapeutic Horsemanship (PATH) International. Whether you are a client (or potential client), volunteer, or professional, it is important to be aware of what is actually out there, who does it, and what questions to ask. Being armed with this information will help you to be able to make an educated decision regarding which type of service is right for you. PATH Intl. designates “equine therapy” services into two main categories: equine-assisted activities and equine-assisted therapies. The determination as to whether a service is classified as an activity or a therapy depends on the credentials of the provider and the overall goals of the intervention. Read on to learn more about PATH Intl.’s definitions for each kind of service. Equine-Assisted Activities: Equine-assisted activities do not require the participation of a licensed professional. Equine assisted activities include therapeutic riding, mounted or ground activities, grooming and stable management, shows, parades, demonstrations, etc., in which the center’s clients, participants, volunteers, instructors, and equines are involved. One of the most common forms of equine-assisted activities, therapeutic riding, is defined by PATH Intl. as an activity intended to contribute positively to the cognitive, physical, emotional and social well-being of individuals with special needs. As mentioned above, facilitators are not required to be licensed professionals but rather are typically PATH Intl. certified riding instructors. According to PATH Intl., instructors are trained to conduct a safe, basic equestrian lesson to individuals with special needs. Equine-Assisted Therapies: Equine-assisted therapies do require a licensed professional. Equine-assisted therapy is a form of treatment focused on rehabilitative goals related to the patient’s needs and the licensed professional’s standards of practice. Hippotherapy and equine-facilitated psychotherapy are the two forms of equine-assisted therapy recognized by PATH Intl..
Hippotherapy is a form of physical, occupational or speech therapy treatment that utilizes equine movement and requires the participation of a licensed physical therapist, occupational therapist, or speech/language pathologist to address impairments, functional limitations and disabilities in patients with neuromotor and sensory dysfunction. To learn more about hippotherapy or to find a provider, visit The American Hippotherapy Association, Inc.
Equine-facilitated psychotherapy (aka equine assisted counseling/psychotherapy) is an interactive process to address psychotherapy goals set forth by the licensed mental health professional and client. The licensed mental health professional works with or as an appropriately credentialed equine professional. Here at ECC, we specialize in providing this service and are exclusively devoted to providing professional mental health care. Curious to learn more about provider credentials and how to become and/or find a certified professional? We whole-heartedly endorse PATH Intl.’s certification programs – in fact all of our staff are PATH Intl. certified professionals! Learn more about the differences between certification and licensing here. Confused? Want to know more? 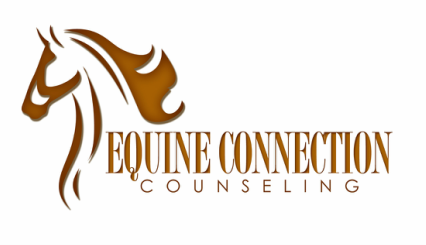 Don’t hesitate to reach out to us at Equine Connection Counseling! We would be happy answer questions and help connect you with the right service for you whether that is with us or with one of our community partners. Dr. Hallie Sheade is a Licensed Professional Counselor and through her practice, Equine Connection Counseling, has conducted over 4,500 equine assisted counseling sessions. She is a PATH Intl. certified Registered Therapeutic Riding Instructor and a certified Equine Specialist in Mental Health and Learning (ESMHL). Dr. Hallie is actively involved with PATH Intl. as a Faculty Candidate for ESMHL training and workshops and a committee member on PATH Intl.’s Health and Education Advisory Committee. She is devoted to furthering the field and has served as invited panelist for PATH Intl. conferences and been selected to give eight peer-reviewed PATH Intl. conference presentations. With her big blue eyes and braided blond hair, Katie* bounded out of the car and ran towards the barn. Her aunt yelled after Katie to slow down and wait for her to catch up. Katie burst into the barn like a tornado asking everyone she saw where the horses were. After a quick introduction to her counselor, Katie made her way down to the play area for her very first session with the miniature horses. Katie approached the horses much like her entry into the barn – an uncontrolled ball of energy. Startled by Katie’s approach, the horses immediately ran to the other side of the play area. Katie ran after them. Despite the counselor’s efforts to help Katie understand that the horses were frightened by her running, she was frustrated and angry when the horses didn’t want to play with her. In a huff, Katie settled down to play in the sandbox instead. As she grumbled about the horses being “mean” and ran her hands through the sand, Katie began to relax. A few minutes later, the horses made their way back to Katie and allowed her to pet them. Prior to living with her aunt and uncle, Katie had a difficult life. Although her mother had tried to provide the very best for her daughter, she had her own struggles. From the time Katie was a baby, her mother would park her in front of the TV to keep her quiet. As Katie got older and became bored with the TV, her mother would yell and scream and even hit Katie. To provide Katie with a safe and secure home, the state awarded her aunt and uncle custody when Katie turned six. As a result of Katie’s early life trauma and neglect, she had difficulty regulating her emotions and would often become aggressive when upset. She struggled to make friends and didn’t understand why the other kids didn’t like to play with her. As Katie’s time in play therapy progressed, she gradually began to see how her behaviors influenced the horses’ responses to her. Soon Katie began to use the horses’ behaviors as “clues” for understanding her own feelings and behaviors. As her empathy towards others developed, Katie made her very first best friend at school. ​Katie’s story is not unique. As many as 20% of youth suffer from a mental health disorder. Most of these children go untreated, avoid treatment, and drop out of treatment prematurely. With an improvement rate of 90%, our evidence-informed services can be life-changing not only for the child but for the entire family. It is crucial that at-risk youth receive needed mental health care in order to grow, thrive, and become happy, healthy, and well-adjusted. This holiday season you can make sure that children like Katie can get their lives back. By donating to the STEPS Angel Fund, you can give a child the gift of healing through horses. *Client names and details have been change to protect client privacy and identity. As an officer in the Army, Pat* had served his country with pride. While on his third deployment, Pat’s Humvee was struck by an IED. Miraculously, Pat came out of the explosion with minimal physical injuries. Many of Pat’s soldiers did not. Despite having ended his service two years ago, Pat struggled to feel at home back with his wife and three children. Pat and his wife fought constantly and he had difficulty connecting with his children. He became more and more isolated, assuming that it would be better to just stay away from everyone rather than risk getting angry and making things worse. The more time he spent alone, the more Pat felt depressed and guilty for the loss of his soldiers. On the brink of divorce, Pat initiated counseling. By the end of the first appointment, Pat appeared happier and felt more like himself again. In the tranquility of the pasture, he felt accepted by the herd of horses. He was especially intrigued by Bandit, an older horse the color of a copper penny. As the weeks progressed, Pat began to look forward to his time with Bandit. Despite the stresses of his day-to-day life, Pat’s worry and guilt faded away in Bandit’s presence. With Bandit, Pat felt accepted for who he was and started to feel less overwhelmed. As their relationship progressed, Pat began to talk about wanting to feel with people the way he felt with Bandit. He started sharing some of his struggles with his wife and found that his relationships with his wife and children improved. Pat’s story is like the stories of millions of Veterans haunted by emotional trauma. As many as 30% of Iraq and Afghanistan Veterans suffer from posttraumatic stress, depression, or traumatic brain injury. Furthermore, Veterans commit suicide at an alarming rate of nearly 22 each day. Many of these individuals go untreated, avoid traditional therapies, or drop out of treatment prematurely. With an improvement rate of 82% and a dropout rate of only 11%, our evidence-informed model demonstrates a higher improvement rate and lower dropout rate for Veterans with posttraumatic stress as compared to other traditional office-based therapies. For this reason, access to viable and proven therapy options are crucial to reconnecting Veterans with their communities, their families, and themselves. This holiday season you can make sure that military Veterans like Pat can get their lives back. 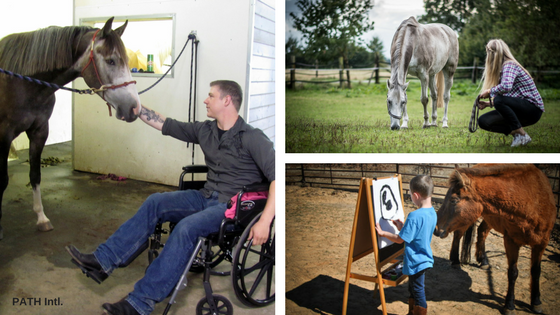 By donating to the STEPS Angel Fund, you can give a Veteran the gift of healing through horses. *Client names and details have been changed to protect client privacy. Many different children come to us for play therapy. Some children come because they’ve experienced trauma and need a safe place to process their experiences. Other children find themselves feeling sad or worried much of the time. Many of these children struggle in their relationships with friends, family, teachers, and others. While some children may act aggressively, others may hide their true feelings. In order to help children struggling with these issues as well as many others, we use Equine-Partnered Play Therapy. By integrating miniature horses into play therapy, children are able to learn ways to feel happier with themselves and in their relationships with others. Read on to get a closer look at the top 3 things children can learn by playing with horses. In order to successfully work with horses, a child must first have empathy. That means the child must be able to understand someone else’s feelings from that person’s (or horse’s!) perspective. Sam came to play therapy to work on reducing his anger and improving his social skills. He frequently bullied and taunted other kids at school and, as a result, did not have many friends. During the first few weeks of play therapy, Sam would often try to startle or “trick” the horses and was confused when the horses moved away from him and wouldn’t let him get close. Over time, Sam began to see that his “bullying” of the horses influenced their response to him. 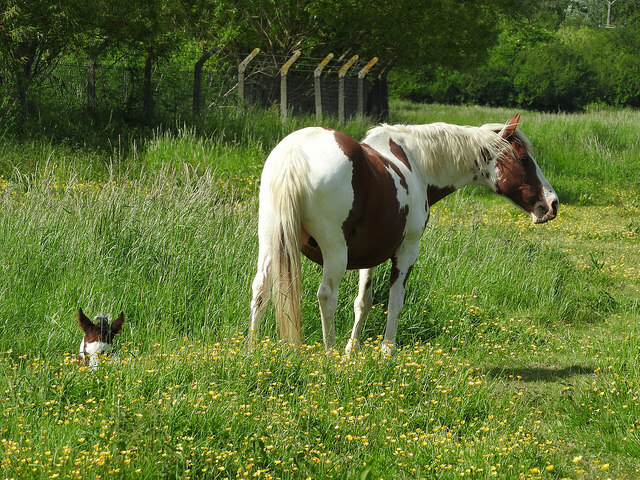 Sam began to notice that the horses responded differently when he approached them calmly and quietly. Over time, Sam was able to connect the horses’ behaviors to their likely feelings. When Sam startled the horses, he surmised that they might feel scared. However, when he approached them calmly, they felt safe. Sam’s parents saw similar changes in his interactions with his classmates and he started getting invitations for playdates. As horse people all over the world will tell you, a horse can tell right away whether or not you’re confident around them. In order to convince a horse to allow you to be the leader, you must feel truly confident in what you want and what you’re telling the horse to do next. Jenna came to play therapy because she often felt very anxious around her peers. Jenna rarely spoke in school for fear of saying the wrong thing and being made fun of by her classmates. Over the course of play therapy, Jenna gradually became more confident in her ability to lead the horses. She learned that in order to walk the horses (instead of the horses walking her), she would need to decide what she wanted to take the lead in showing the horse. As a result, Jenna’s confidence grew enabling her to start raising her hand in class and take on leadership roles in small group projects. Many children struggle with the ability to control themselves when faced with strong emotions and difficult situations. Oftentimes, the feelings can be so overwhelming that children don’t always have the internal resources to manage these feelings, which can result in tantrums and outbursts. Jason came to play therapy to work on his disruptive behaviors and tantrums, often in response to frustration or being told “no.” Jason was very interested in the horses and tried to find ways to integrate them into much of his play. Despite Jason’s best efforts, the horses did not always play along – at least not the way Jason wanted them to. While at first Jason would get mad and call the horses “stupid,” over time Jason began to notice that the horses often moved away when he became frustrated. He learned that in order for the horses to feel safe, he would need to be calm. 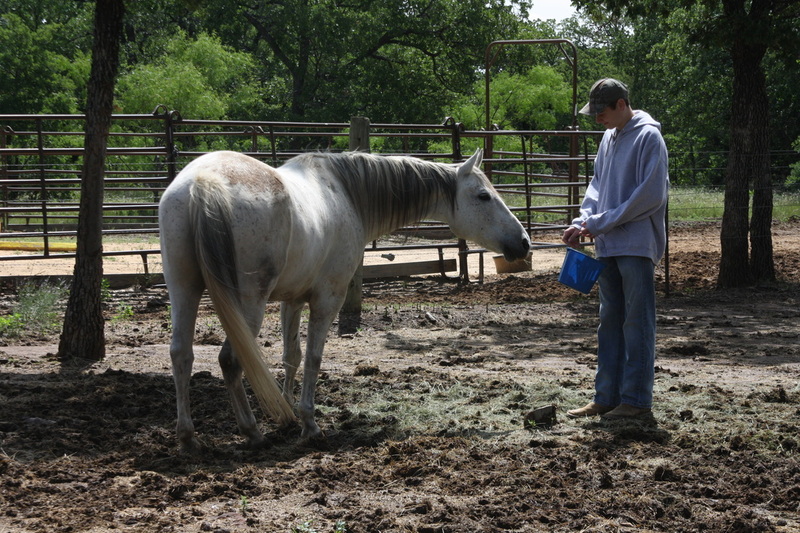 Jason began to catch himself when becoming upset and use coping skills to calm both himself and the horses, allowing them to continue their play. Jason’s parents soon noticed that Jason began taking “time-outs” for himself to calm down and was able to express himself more clearly and calmly rather than throwing a tantrum when he did not get his way. Equine-Partnered Play Therapy is a unique model for counseling young children. If you’re interested in learning more about our services for your child, please feel free to call us at 682-334-3784. For mental health and/or equine professionals interested in facilitating EPPT: We periodically schedule EPPT trainings. Check out www.equineconnectioncounseling.com/trainings to attend our next training! You'd be hard pressed to find an equestrian who doesn't believe they've learned a lot simply by being around horses. But whether you are an experienced horse person or have never seen a horse up close, there are many things about life and living that horses can teach us. Here are five lessons we learn from our equine therapy partners over and over again. The dictionary defines authentic as being real or genuine. Humans learn to hide many things inside because of messages we've internalized from our families, friends, and society at large. Constantly hiding our true selves and our experiences can lead to physical and emotional stress. Horses, on the other hand, do not know how to be anything other than who and what they are. They also understand authenticity--it is uncomfortable for a horse to encounter a human who is not being genuine because it is difficult for a horse to gauge how safe that person is to be around. Horses teach us that it is healthy to always be who we truly are. Horses aren't very concerned about the past or the future. They don't think in terms of their next meal, they think more along the lines of, "I'm hungry right now." Much of the emotional stress that humans experience has to do with dwelling on what happened before and what might happen in the future. Attending to our here-and-now experience can be powerfully healing. You may have heard the practice of being present referred to as mindfulness. Mindfulness is an important tool in recognizing and managing emotions, something that many clients who struggle with depression, anxiety, or trauma identify as an area of struggle. Horses are always in tune with the present moment so that they can keep themselves comfortable and safe. This idea goes hand-in-hand with being present. Horses are focused on the present moment, so if right now includes a dangerous situation, the herd will immediately react in order to keep everyone safe. Once that danger is past, however, horses have the ability to return almost immediately to their previous state of calm. They don't worry about the next time the bear might come out of the woods or what they could have done differently the last time they encountered a bear. This ability to let it go sets a great example for those dealing with trauma and anxiety. Have you ever had a conversation with someone that makes you wonder how sincere they are? Horses might not be able to speak, but they are still master communicators. Horses are deliberate with everything they do. In the herd, this keeps other horses from being confused about what is going on and therefore maintains safety. It's difficult for everyone to be secure if they have to second-guess whether their herdmate actually means it when they say that bear is on its way to eat them. For people who struggle to communicate effectively, it can be a challenge to ask a horse for what they want. Horses will respond if we communicate clearly and assertively (note that we didn't say "loudly"). Horses are herd animals. Everything from their physical safety to their emotional security depends on having other horses with them. Humans are also hard-wired to be in relationships and we can gain a lot by having a support network. However, humans have a tendency to withdraw from their social supports when dealing with life's challenges. 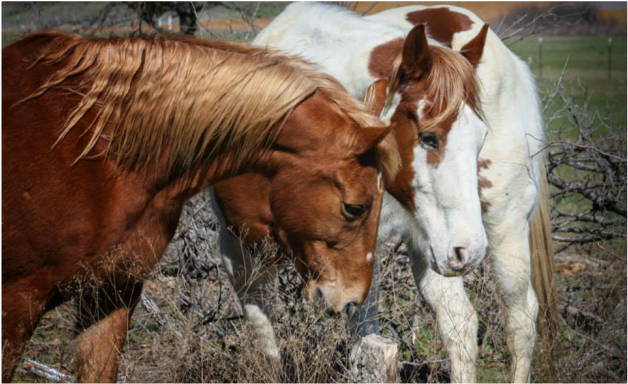 Horses' relationships with each other become more important during times of stress and danger. They know that having someone at your back can make all the difference. For people, a "herd" can consist of family members, friends, co-workers, and professionals (like teachers or therapists!). Have you learned any important lessons from horses or other animals? F​irst things first: what we are discussing today is only a teeny, tiny piece of a vast and complicated body of information. If you are interested in learning about these things in more detail, you can find a list of suggested books and resources that explain the brain and interpersonal neurobiology much better than we can here! When humans have a social interaction, there are measurable changes that occur to our brains and nervous systems. These changes in our brains are part of a growing field of scientific research known as interpersonal neurobiology (IN). 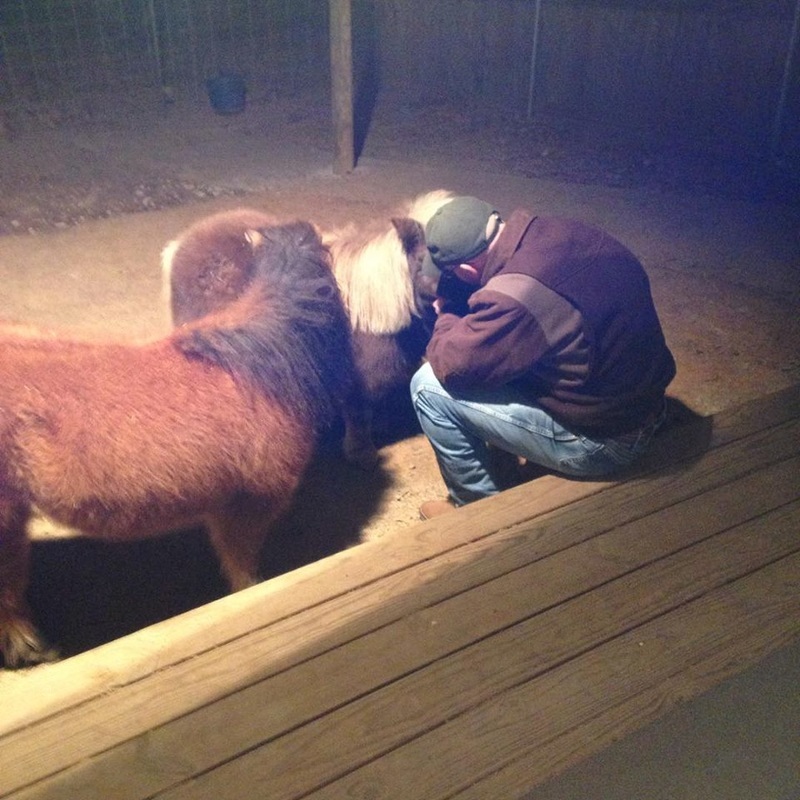 IN has contributed a lot to the type of equine assisted counseling practiced by the ECC counselors. It is thought that the same neurobiological effects that people experience when interacting with other humans also happen when interacting with other social animals like horses. All animals, including humans, have mirror neurons. Mirror neurons are a type of brain cell that helps us recognize and empathize with emotion in other living things. There are millions of them in our brains. They enable us to feel sad when we see someone cry, embarrassed when we see someone humiliated, or happy when we see someone smile and laugh. In interpersonal neurobiology this is known as resonance. Researchers and clinicians suggest that the way our brains and bodies respond to another person’s emotional state facilitates the awareness needed for our brains to activate new neural pathways—which in turn enables us to learn new ways to self-regulate and manage our emotional experiences. So when a counselor interacts with his or her client in a way that is empathetic, open, and accepting, they are essentially giving the client’s brain an opportunity to learn self-awareness and self-acceptance. Some people have theorized that horses have millions or billions more mirror neurons than people do, making them experts at understanding nonverbal communication. All those mirror neurons enable horses to empathize even more than people do. In counseling, the horse can pick up on emotions that human clients and human counselors might not be aware of yet. It also means that humans and horses can engage in social relationships on a neurological level; although facial expressions and language might be different, the horse’s and human’s brains can respond to each other and build a relationship. When we consider that IN is based on the idea that a counselor’s empathy and non-judgment can help a person to heal, imagine how much someone can gain from interacting with an animal that has an even greater ability to be empathetic and accepting. A lot of the field of IN is based on what little we know about the human brain and a lot of theory by experts. However, more research is being conducted all the time and there is an ever-growing body of information about things like mirror neurons, resonance, and the social brain. If you would like to learn in more detail about these topics, we suggest looking into the resources below.